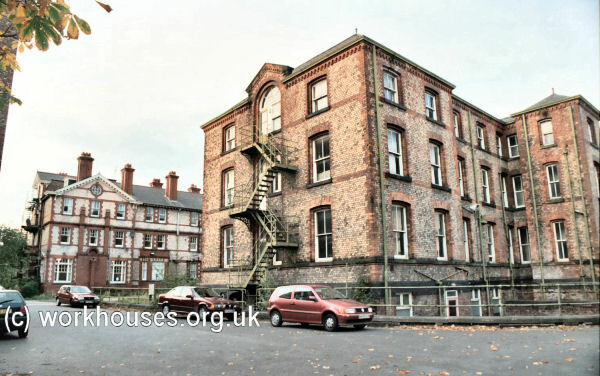 Township workhouses in the Chorlton area included on at Gorton. In the 1830s, its Master received 3 shillings a week for each pauper in his care. Inmates could wear their own clothes but not bring their own bedding as it led to jealousies. A medical officer received £30 per year, from which he had to supply all medicines etc. except for trusses and leeches. Lancashire: Ardwick (2), Burnage, Chorlton-upon-Medlock (5), Chorlton with Hardy, Didsbury, Gorton, Hulme (3), Levenshulme, Mosside, Rushulme, Stretford, Withington. The population falling within the Union at the 1831 census had been 46,465 — ranging from Mosside (population 208) to Chorlton-upon-Medlock (20,569). 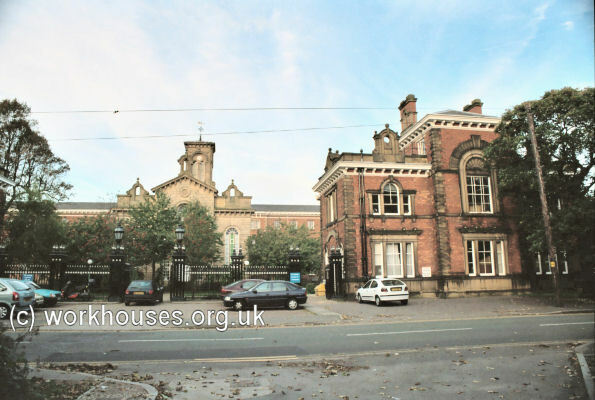 The first Chorlton Union workhouse was located the junction of Stretford New Road and Leaf Street. The building, presumably a former township workhouse, accommodated 300 inmates. The female quarters were placed at the west and male at the each, each side having separate areas for old, young, children, the sick, lunatics and itch cases - twelve separate exercise yards in all. A communal dining-hall and chapel lay at the centre of the building. Children in the Stretford Road workhouse occupied their "spare time" by working at the laborious task of pin-heading. They were allowed a respite during Guardians' meetings as the noise from the work caused too much disturbance. School hours were less than three a day. Several early teachers had themselves to be sent to school, and one or two were discharged because they could neither read nor write. Early schoolmasters often doubled up as assistant overseer and workhouse porter, for which they received a total salary of £25 per year, plus board and lodging, on condition that they should be able to teach the Catechism. The Stretford Road workhouse soon proved inadequate to cope with the demands of the rapidly increasing population of the area. Since the site was not capable of being expanded, the Guardians decided that a completely new building was needed elsewhere. 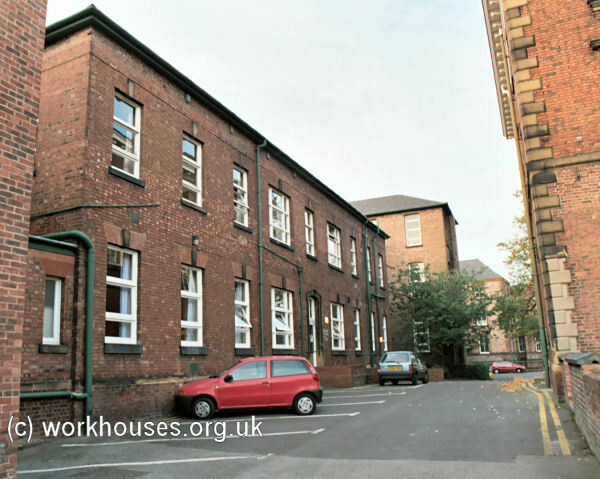 The new workhouse was located on a green-field site at Barlow Moor, Withington, at the north side of what is now Nell Lane. 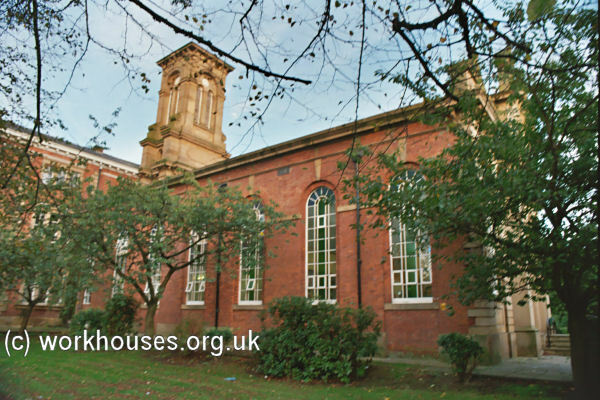 The building was erected in 1854-5 and was designed by William Hayley, Son and Leigh Hall. The workhouse cost about £53,000 and accommodated up to 1,500 inmates. The layout of the site can be seen on the 1916 map. Chorlton bird's eye view from the south-west. 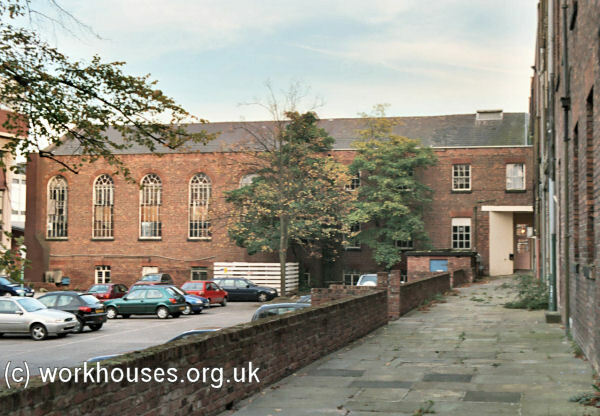 Chorlton workhouse entrance from the south, 2001. 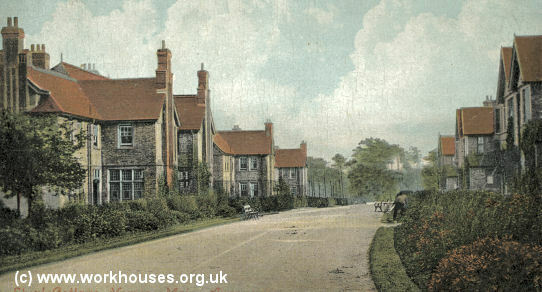 Chorlton workhouse from the south, c.1910. 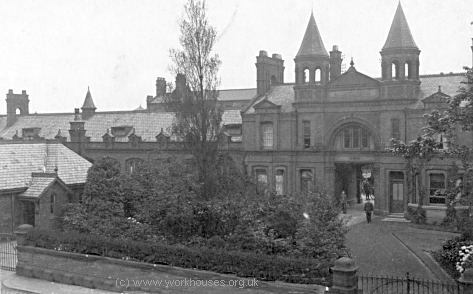 Chorlton workhouse from the south, early 1900s. Chorlton chapel from the south-west, 2001. 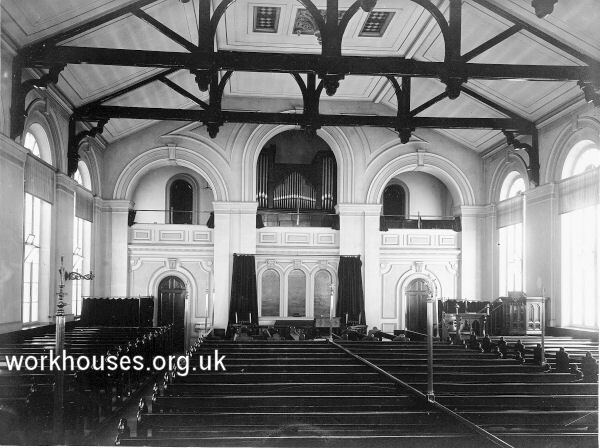 Chorlton workhouse chapel interior, early 1900s. Chorlton main block from the south-west, 2001. Chorlton main block from the north-east, 2001. Chorlton dining-hall and kitchens from the west, 2001. Chorlton workhouse master's room, early 1900s. Hospital blocks were erected at each side of the main building. Chorlton male hospital block from north-west, 2001. Chorlton 1864 ward pavilions from the east, 2001. 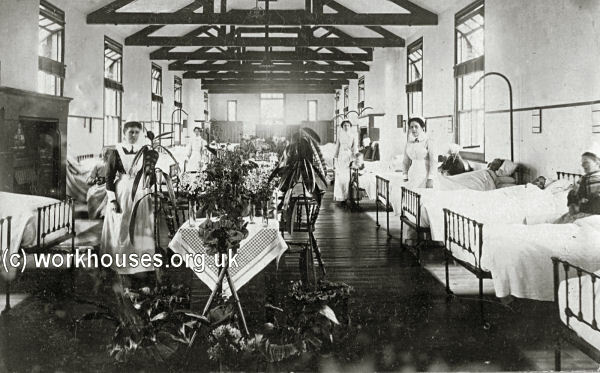 Chorlton workhouse infirmary ward block, early 1900s. Chorlton ward interior sketch by Thomas Worthington. 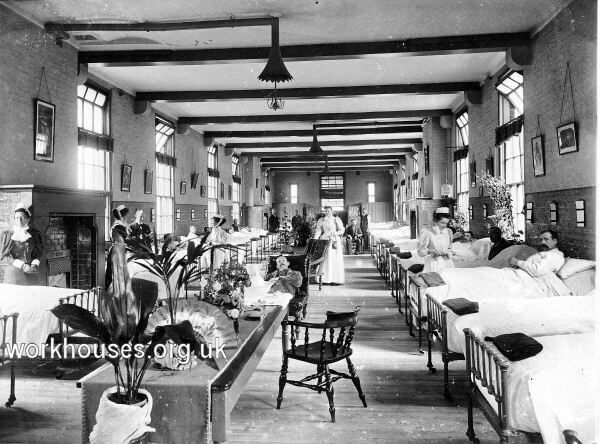 Chorlton workhouse infirmary women's ward, early 1900s. 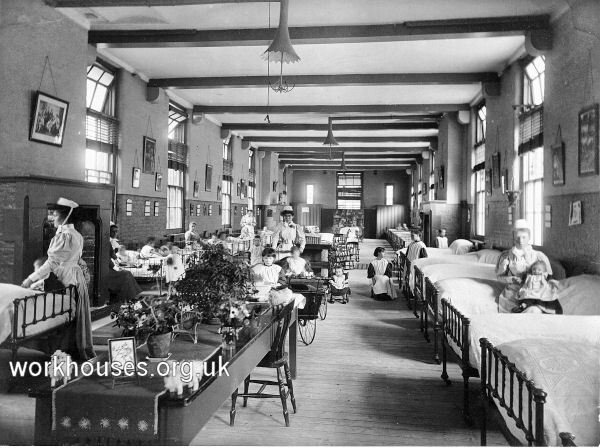 Chorlton workhouse infirmary men's ward, early 1900s. 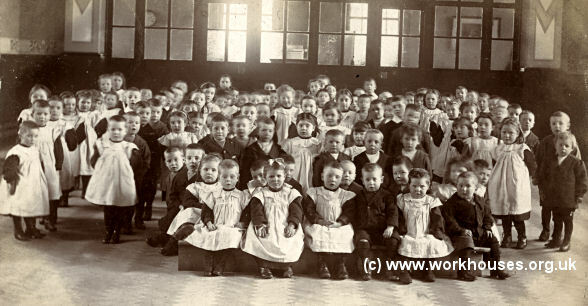 Chorlton workhouse infirmary children's ward, early 1900s. 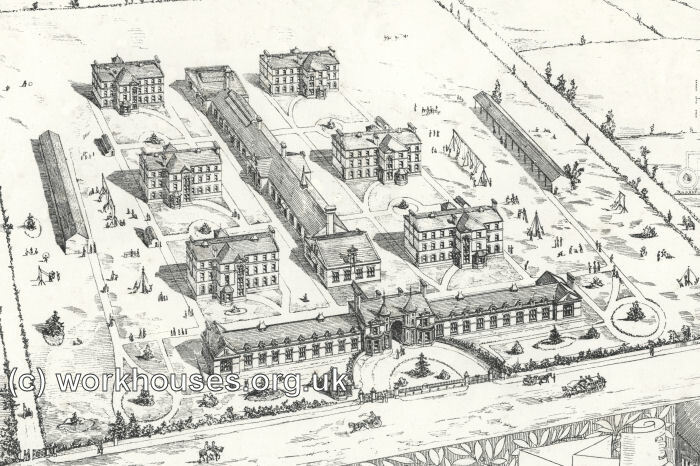 Following the opening of Worthington's hospital, the original hospital blocks were converted for use as lunatic wards. An isolation hospital was built at the west of the site in 1872, next to the workhouse cemetery. It housed over 50 patients and its construction cost £2,000. 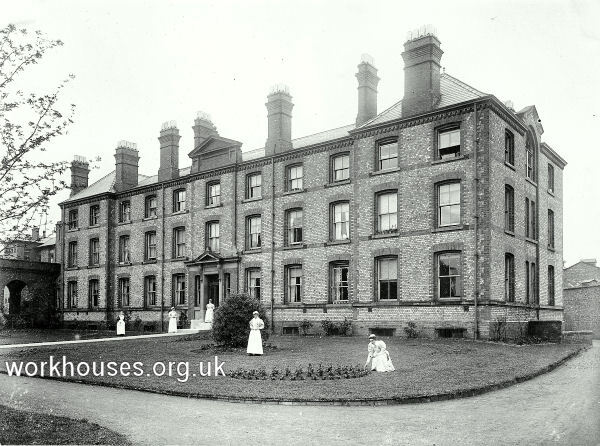 Nurses' homes were erected in 1885, 1903 and 1913-15 at the north-west of the workhouse. 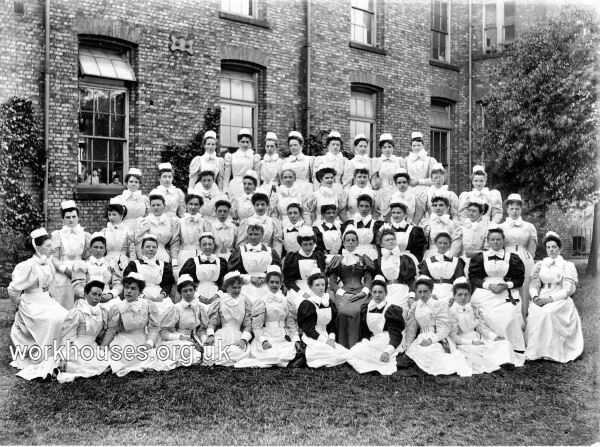 Chorlton 1885 nurses' home from south-west, early 1900s. Chorlton 1885 (front) and 1903 (rear) nurses' homes from south-east, 2001. An immense kitchen, in which potato-hash had apparently been prepared by the cart-load in a series of huge boilers, first attracted our attention. Passing through this apartment we gained the dining-room. This place is fitted up with a series of fixed tables and seats arranged something like the pews in a chapel, the diners being seated side by side and back to back. The women do not sit with the men, but, like Dr. Johnson, at the publisher Cave's, partake of their food behind a screen, which screen runs up the centre of the room. The old people occupy the front seats, the middle-aged and young come next, and the children bring up the rear. We first inspected the dormitories, each room containing 32 beds, all scrupulously neat and clean, to which the inmates retire at 8 o'clock at night, rising at 5-45 a.m.
After a peep into the chapel, which, though conveniently constructed for its purpose, does not present any striking features of architectural beauty, we commenced a systematic tour through the female wards, and found ourselves in a room devoted to the mending of stockings. Some twenty women were employed on a huge stack of them darning away for dear life we passed on to what may be termed the baby-house. Here we found some fifteen babies under the care of nurses, some rolling about on the floor, some warming their little tootens at the fire, whilst one little cherub (the pet of the house) with rosy cheeks and flaxen curls lay sound asleep, looking the very incarnation of beauty and innocence. In the same room was the cradle of the establishment, a sort of Noah's Ark, only it was constructed to carry six inside instead of eight, and no lower animals. We then entered the old women's sitting-room, where the dear old creatures past all work sit and croon and twiddle their thumbs. It is true some of them make a pretence of doing a little darning, but they seem quite at liberty to do as much or as little as they like. One very sprightly old woman of over eighty appears to be a sort of chartered grumbler, and we were informed by the Governor that she always succeeded in getting in the last word. Strange as the occupation may seem for a woman she had formerly been a sweep, and she told us with pardonable pride that she had been up many a chimney, petticoats and all. Her name is Becky Mathews, and each remark she makes comes out with a report like a fog signal. When asked if the soup was better today she said, "No". When reminded that fewer peas had been put in to please her, she jerked out, "Its not to please me, it's to save the peas." The next ward we visited, the Female Imbecile Ward, is very sad and depressing, though one cannot help being amused by the oddities of some of the inmates. One old woman, Sarah Brownhill by name, spends her time in counting the birds, which occupation; she believes, materially conduces to the welfare of the establishment. Another member of, this ward informed us she liked to see gentlemen, she had got completely tired of the, society of ladies. The next ward we visited was devoted to what is termed epileptic patients. They area not imbecile, but from being subject to fits, are quite unfit for work. One girl committed a secret to my keeping, but seeing she is in a habit of telling everyone I feel no compunction, in revealing it. She tells me the doctor wants her to marry him, and has promised her a pair, of earrings and a finger ring, but she has not get them yet... her name is Polly. In an adjacent room were the older women, one of whom seemed highly amused because another had forgotten her age. She laughed until she shook again, and said she liked laughing because it made her fat. The next room we visited upset all the notions of Bumbledom we had inbibed from a perusal of "Oliver Twist". It was the Nursery, devoted to children between the ages of two and five years. It might be thought the presence of the governor and his wife would have awed these youngsters into silence — not a bit of it — no sooner had they entered the room than there was a crowd around them fishing in their pockets to see if they could find any toffee or toys. Happy little souls, too young to feel their somewhat forlorn condition, but old enough to appreciate the little favours shown to them by the kind-hearted governor. We now come to a branch of the workhouse that cannot fail to fill the heart with sadness, the Hospital Wards. In spite of the admirable arrangements for comfort, in spite of the exquisite cleanliness of every nook and cranny, the lovely flowers, the womanly tenderness which watches over the sick and the suffering, supplying every want, anticipating every wish, the visitor can rarely enter these wards without the consciousness that he is in the presence of death. There are five sick wards; two for men, three for women. We entered one of the latter first and therein came face to face with the oldest and youngest inhabitants of the place. The oldest numbers 99 years and although she is bedridden, retains all her faculties. She addresses you with sublime resignation and cheerfulness which is in itself a lesson, and listens to any remarks you make with keen intelligence. The youngest inhabitant was lying in his mother's arms, and had only made its debut in the world of suffering about thirty-six hours before our visit. Poor little mortal. Will it end its days where it began them, or carve a way to fame and fortune. Another rather gruesome sight is the elderly woman who makes all the shrouds for the defunct paupers. For twelve years past this has been her constant occupation, and she talks about business being busy or otherwise with a calmness that gives you the creeps. We next went into the Men's Hospital Wards, where, again brightness and kindness prevailed. There were three old men in this room, none of whom would probably survive twenty-four hours. One, particular, whose face haunts us to this moment, had an expression of mute agony on his face which was absolutely appalling. He had not spoken for twelve hours. The brow was contracted, the lips firmly set, and the body, with hands clenched and one shoulder raised, was perfectly motionless. Only the eye moved, but the way it followed you about the room was enough to chill your blood, yet it did not excite horror so much as an intense awe-struck sympathy. The face was a fine one, and the whole picture reminded me irresistibly the Christ of Velasquez. As far as relations were concerned he was dying alone, and we thought it sufficiently sad; but how much worse might it not have been in some den in Charter Street, with no tender womanly hand to minister to him. Round the fire was collected a group of old men warming their hands and looking out for the tea and bread and butter which was being served out, their meals being probably the only object of interest to them. One of the patients with a talent for drawing was supplied with board, pens, ink and paper, on which to pursue his favourite amusement He seemed to have done with this world; he knew he could not recover, and had made an elaborate design for his own monument, with an inscription complete save for the date of death, for which a vacant space was left. We left this ward with feelings of deep commiseration which checked all tendency to mirth, and our route was pursued almost in silence until we came to the cooking house, where the creature comforts of the healthy and convalescent are provided for. We were formally introduced to the family teapot which holds the modest quantity of 175 gallons, while the soup tureen is capable of containing 120 gallons. Everything here is on a gigantic scale. The room is lofty and well ventilated, the rack for steaming the potatoes looks as if it would hold the produce of half an acre, and the enormous milk-cans are suggestive of many cows. After inspecting the scullery we came to the dining room and saw all the inmates filing off to their seats, the men on one side, the women on the other. Before their entrance we had a chat with one of the men whose powers of conversation did not belie the intelligence of his countenance. We found he was one of the numerous inmates who had seen better days, and he turned out to be a man of considerable culture I believe that doctors are not agreed as to the causes which produce baldness, but a fact mentioned by the governor may throw some light on the subject if scientifically discussed. All the men in the house who have bald heads have, at one time or another, been in good circumstances, and have been brought down either by misfortune or dissipation. The buildings are so arranged that they are always surrounded by a current of air. No matter which ward you may go into there is always a door opening on to a nice open space with grass plots, gravel walks, and in some instances arbours which, in fine weather, are frequented by the old men, who sit there smoking tobacco when they can get it, and dandelion leaves, or even old rags when they cannot come by the genuine article. 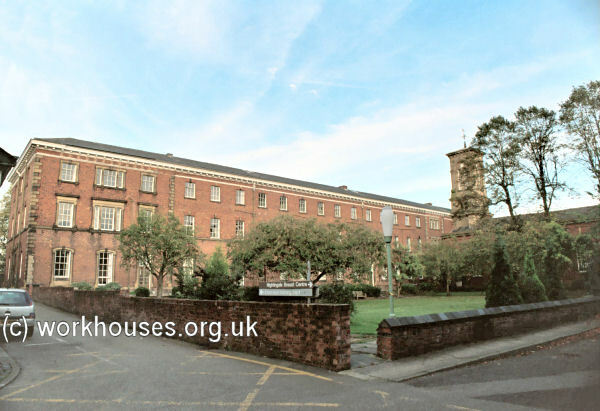 Another rather longer account of a visit to the Chorlton workhouse in 1871 is available on a separate page. On November 9th, 1879, details emerged concerning the recent death of Charles Cartwright, aged sixty-four, who had been for many years an inmate of the workhouse. Cartwright had squandered two fortunes of £40,000 and £80,000 respectively. He lived contentedly in the workhouse, and employed a portion of his time in writing poetry and also sermons for some clergymen of his acquaintance. When in possession of his wealth he had driven to his works in a carriage drawn by four horses, and he now seemed unable to restrain his extravagance when temporarily out of the workhouse. At one time his friends allowed him £1 a week which, according to the clerk to the guardians, he used to spend in driving about in cabs, smoking expensive cigars, or dining at the most expensive restaurants. When his last half-crown was reached, he gave that to a cabby to drive him, still in state and with a choice Havanna, back to the workhouse. In 1894, the British Medical Journal set up a "commission" to investigate conditions in provincial workhouses and their infirmaries. Following a visit to Withington, the commission's report gave the establishment a glowing report. 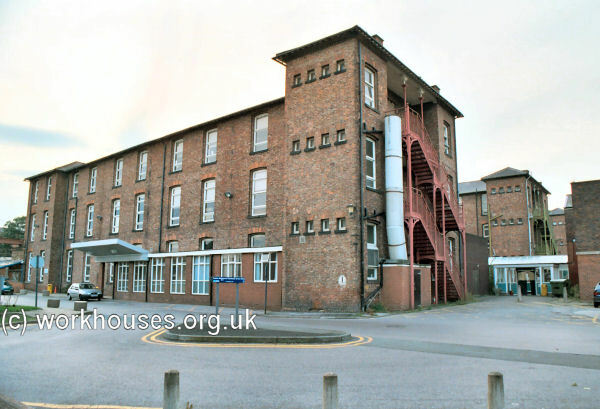 Unlike many other workhouses reviewed by the commission, Reading had modern, purpose-built infirmary wards, and a well resourced nursing staff. Further details are available in the full report. 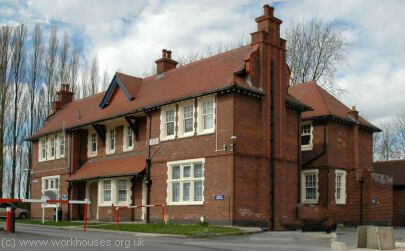 The workhouse's medical facilities were further expanded in 1902 by the erection of two new hospital pavilions at the north of the site. Chorlton workhouse from the south, c.1930. In 1910, ownership of the site passed to the Township of South Manchester. In 1915, the Poor Law Unions in the Manchester area underwent a major re-organization with the formation of a single new Manchester Union. 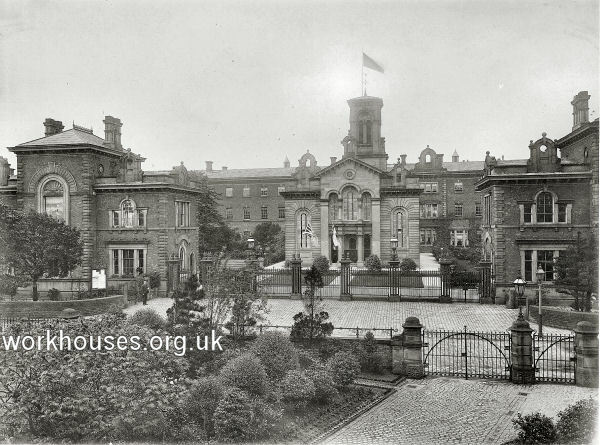 The former Chorlton workhouse was then renamed Withington Hospital. After 1930, control passed to Manchester Corporation until 1948 when the hospital became part of the National Health Service. The site is undergoing a major redevelopment. 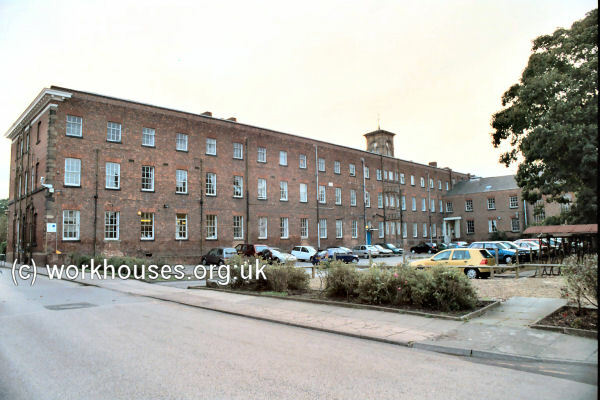 Although the entrance blocks and main workhouse building are being preserved, the old infirmary blocks have been demolished and replaced by housing. 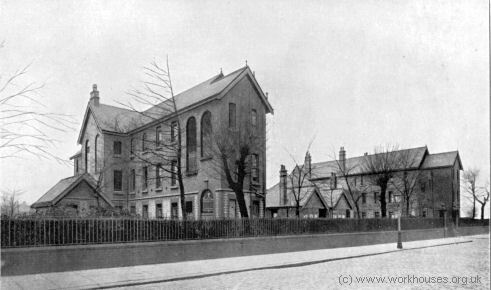 In 1880, the union erected new schools and children's home on a site opposite to the workhouse at the south side of Nell Lane. Its layout is shown on the 1916 map below. IN consequence of the overcrowded state of the workhouse, last year the guardians were impressed with the necessity fur making some permanent additions, and after careful consideration, decided that the best mode of doing this would be by procuring separate and special accommodation for the children numbering at that time 271 of school age, and about 70 infants, thus setting at liberty day and sleeping-rooms sufficient for the accommodation of more than 200 adult paupers in the workhouse. The several new buildings are detached and grouped so as to admit of a free circulation of air, and consist of six homes, three of which are situated to the right, and three to the left of the administrative block : the schools are placed to the front facing Nell-lane, with dwellings for schoolmaster and schoolmistress in the centre. Each home will provide 50 children with living and sleeping accommodation. On the ground-floor is provided a day-room 33ft. 6in. by 17ft., sitting-room for the official in charge, lavatory containing 10 washbowls and 2 baths, store-room, and w.c., and slop-closet. The first pair floor contains two dormitories 33ft. 6in. by 17 ft., and 17 ft, by 17 ft., holding 24 beds, bedroom for official, w.c., slop-closet, and store-room. The second-pair floor contains two dormitories the same size as on first-pair floor, and holding 24 beds, and a bedroom to hold 2 beds in case of slight sickness or separating weakly children from the rest ; w.c., slop-closet, and store-rooms. The administrative block of buildings is situated in the centre between the boys' and girls' homes, with accommodation for 3 work-rooms, dining-hall 70ft. by 38ft., cooking-kitchen, official's sitting-room, bread-store, larder, wash-house, laundry, and drying-closet, linen-room, boiler-house, engineer's-room, and boys' plunge-bath. The whole of this block is one story high, and the portion occupied by the bath, wash-house, boiler-house, stores, and laundry, would be ventilated front the top with louvres, and have rough plate-glass roof lights in addition to the windows. The boys' school is situate to the right of the front block, and the girls' school to the left ; each are provided with a school-room 95ft. by 22ft., and two class-rooms, each 18ft. by 14ft., and 2 book-closets. The children are admitted to the schools by a porch entrance from the yard, and an additional entrance at each end of the building. The schools and class-rooms would be heated by the circulation of hot water. Provision is made in the centre portion of this block for a schoolmaster and schoolmistress' dwellings, separated by a central archway, forming the principal approach to the several buildings ; each dwelling Will have, on the ground-floor, a sitting-room, kitchen, and pantry, and on the first-pair floor, 3 bedrooms, bath-room, and w.c. The elevation to the front block of buildings are faced with stock bricks, the moulded working in red terra-cotta ; the window-sills, copings, &c., being stone ; the other buildings being faced with light-coloured picked common bricks, set headers, all angles, arches, and the various strings being built with stock bricks neatly dressed off, the inside walls being faced with common bricks dressed off for limewashing, the lower portion, for 4ft. in height, being faced with white glazed brick and coloured border. The estimate, exclusive of fittings, amounts to £l6,924. Mr. James Herd is the general contractor for the several works, and the following sub-contractors are engaged under him:— Mr. Charles Normanton for the brickwork, Messrs. Stephenson and Corcoran the masonry, Mr. James Barrow the slating, Mr. Henry Lightfoot for the plumbing, and Mr. Richard Higson for the plastering and painting, and Messrs. Mangnall and Littlewoods, of Manchester, are the architects. Chorlton Schools from the north-east, 1880. 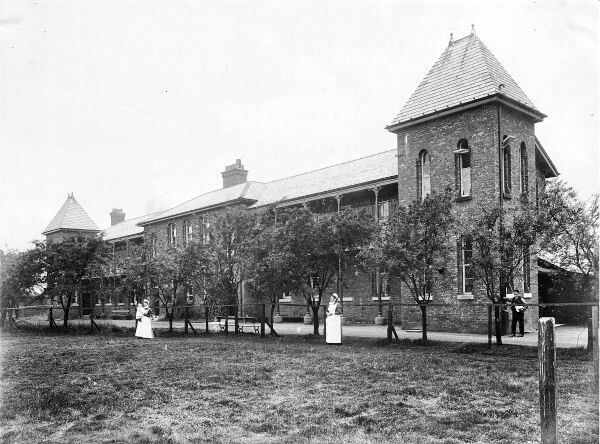 Following the erection of the union's cottage homes at Styal in 1898, the schools site appears to have been converted for use as additional hospital accommodation under the name of Chorlton Hospital. The 1916 map shows that extensions had been added to each house and three additional blocks erected at the south-west. 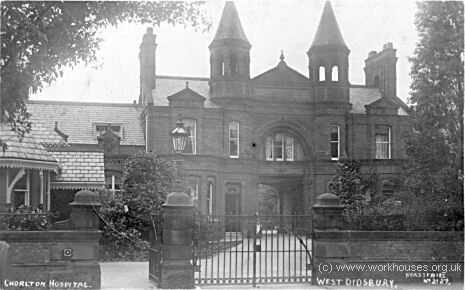 Chorlton Hospital entrance from the north-east, c.1911. 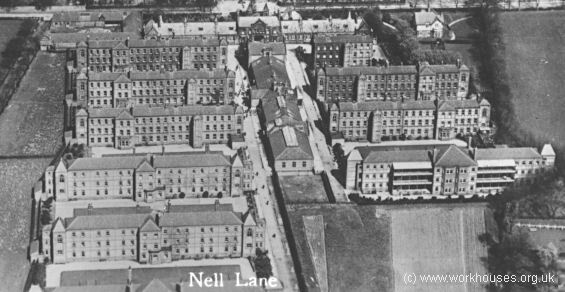 During the First World War, the site became Nell Lane Military Hospital. 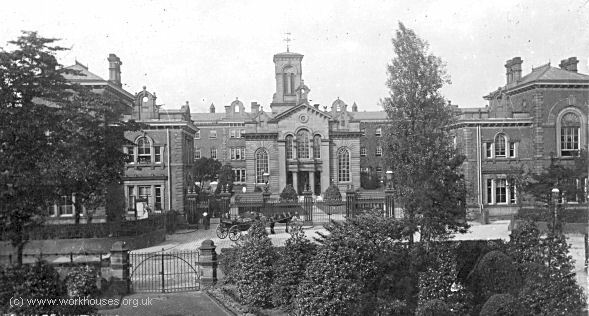 Nell Lane Military Hospital entrance from the north, c.1915. The buildings have now all been demolished. 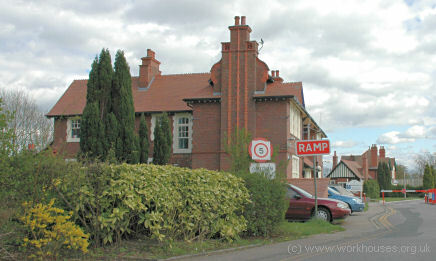 The Dr Rhodes Memorial Home, a reception home for 150 children, was erected in 1910 on Cavendish Road, a little way to the north-east of the workhouse. The ground-floor is devoted to the administrative department. The principal entrance is from Grosvenor-square, and leads to the various offices, being used by the Guardians and by people who have business with the Board. The entrance for the poor is from the loading or cart-way, which is placed in Grosvenor-square, at the north end of the plot. The entrance for vagrants is from Lyceum-place. An iron gate, fixed in the loading way, separates the vagrants' portion from the rest of the building, and it will be the duty of the porter to close this gateway at six o'clock each evening, thereby keeping vagrants entirely isolated from the rest of the occupants. To the left of the principal entrance first described, after passing through the vestibule, which will have glass doors, will be Mr. Edgill's office, with an ante-room adjoining to a passage communicating therefrom to the registrar's offices, which will be of ample size, with a large. sized fire-proof room for the storage of books and documents, and with a private room, also immediately adjoining the registrar's office, which will be used principally for the registration of marriages ; a waiting-room on the right of principal lobby, adjoining to the porter's room, will be used by persons waiting to see the officials upon that business. Adjoining to the porter's room is a small room for stationery, &c. Farther along the principal lobby is the room appropriated to chief and second clerks, for the paying and receiving of accounts. A waiting-room is placed between these rooms, and is convenient to both. There are lavatories and water-closets, &c., on the right hand of the lobby. The principal staircase rises from this lobby to the floor above. To the front of Grosvenor-square are placed the six rooms for the relieving-offices, each of which is in immediate communication with the waiting-room for the outdoor relief poor; each office will be so arranged that there will be two entrances, and two applicants for relief can be heard at the same time, although out of sight of each other, yet so placed as to be seen by two guardians on relief-days at the same time. The applicants would then leave by the passage leading direct to the loading entrance, and would either get their relief-ticket for provisions, or money from the pay-clerk, as the case may be, and would leave without again coming into communication with the rest of the applicants. The out-relief store and pay-clerk's office are placed between the entrance and exit doorways to the general waiting-room. The first floor is chiefly devoted to the use of committee-rooms, board-room, &c. The Board-room is placed at the junction of Grosvenor-square and Cavendish-street, and is lighted from both streets, an oriel window being introduced at the angle, which recess is not only convenient, but assists to give some character to the room at no great expense. The Board-room is 36 ft. by 29 ft., and is 21 ft. in height : the upper portion is of circular form, and raised above the square of the general eaves of the building. This extra height of the room is obtained in the formation of the Mansard roof, which is purposely introduced so as to give the extra height. Two waiting-rooms adjoin the board-room, and also the committee-rooms. The room for the school attendance officers is on this floor, likewise the warrant and commitment officers' room. The front portion of the basement, and that portion under the large waiting-room, will be devoted to rooms for the use of the outdoor relief poor, and will be chiefly used as workrooms during times when the workhouse is crowded, or in winter and severe times of distress, when a large number of the poor could be here found means of employment either in oakum-picking, cutting up wood, or some other such indoor employment. A kitchen and large scullery or washhouse will be provided in the basement. The vagrants' wards are situate at the back of the main building, and will be approached from Lyceum-place by vagrants who will be prevented by an iron gate from passing through to the front of the building. The superintendent's office will command the entrances for both males and females. The men's workrooms are placed on the ground-floor and also on the basement-floor. In the early 1890s, the Chorlton Board decided that children and babies should be accommodated at separate premises away from the workhouse. In 1894, the Board of Guardians established a sub-committee to pursue the establishment of a cottage homes colony. A site near to Quarry Bank Mill was identified and a loan of £50,000 was obtained from Liverpool Corporation to fund the project. The foundation stone for the homes was laid on 31st August, 1896, by Arthur Balfour, MP for East Manchester. The architect was JB Broadbent of Manchester. COTTAGE HOMES FOR CHILDREN, STYAL, CHESHIRE.— A model village (embracing schools, cottage homes, and hospital) was opened on the 4th inst. at Styal. Tire buildings have been erected, at a cost of 50,000l., by the Chorlton Union Board of Guardians for the accommodation of pauper children. There are a dozen homes, having twenty beds each, and four smaller homes with ten beds each. The interior arrangements of the homes have been specially designed to facilitate the work of foster parents who will have to look after the families. In addition to these homes there is a probationer's lodge, where newcomers will undergo a kind of quarantine for a fortnight before being drafted in the homes. There is also, isolated from the homes, a hospital with all modern conveniences, whilst at the rear of the ironies is a block of administrative buildings, including the workshops, laundry, stores, and a swimming bath. Then some distance away is a school capable of accommodating 500 children. The architect of the scheme is Mr. J. B. Broadbent, of Manchester. 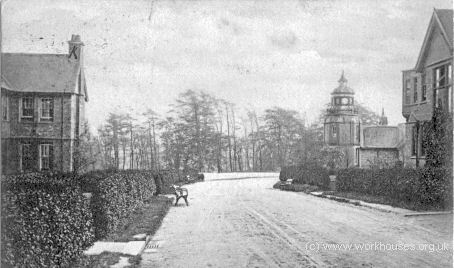 Styal Homes entrance, early 1900s. Styal Homes Main Avenue, c. 1907. Additional probationary homes were added in 1905. 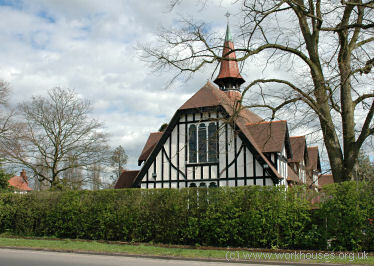 A Church of England chapel was erected near the site entrance. Only Protestant children were accepted at Styal — Roman Catholic children were placed elsewhere. Children's nursery at Styal Homes, c.1908. 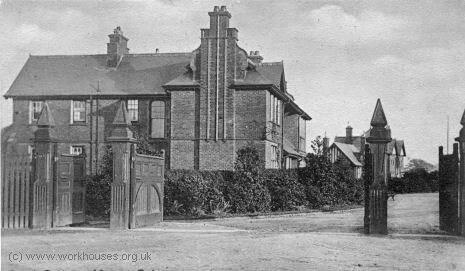 In 1928, the site was extended to the north and additional cottages built to accommodate 200 children from the Swinton Industrial Schools which was being closed down. A new recreation hall and gymnasium were added in 1930. The Styal homes location and layout are shown on the 1930s map below. 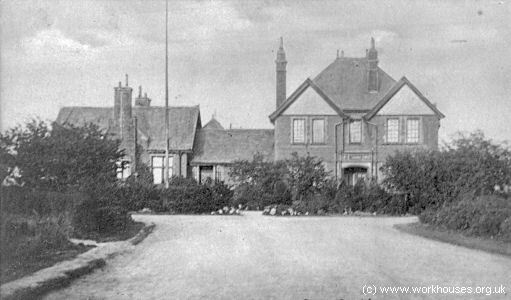 Styal Homes, Superintendent's House from the south, c.1910. Styal Homes Superintendent's House from the south, 2005. The homes closed on 20th July, 1956. In December that year, refugees from Hungary were accommodated on the site, staying until 30th September, 1959. On 23rd May, 1960, the Prison Commission took over the site and on 24th October, 1962, it re-opened as Styal Prison, a semi-secure prison for women. The houses and hospital at the north of the site have now been demolished. 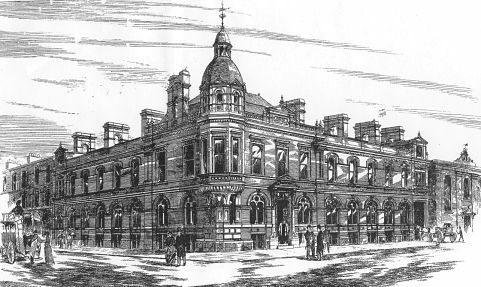 Greater Manchester County Record Office (with Manchester Archives), Archives+, Manchester Central Library, St Peter's Square, Manchester M2 5PD. Relatively few local records survive — holdings include: Ledgers (1837-1915) with gaps; Styal Cottage Homes admission registers and log books (1903-1956); Lists of emigrant children sent to Canada and other countries (1889-1947, indexed). Edwards, Gerard (1975) The Road to Barlow Moor . Pass, AJ (1988) Thomas Worthington. Victorian Architecture and Social Purpose . Building News , 23rd January, 1880. Thanks to Sarah Newton for contributing the indicated photos from her family archive.